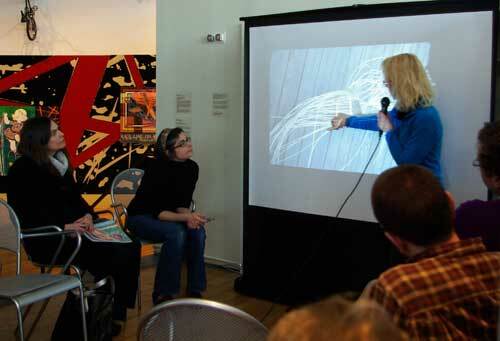 This past Saturday, Nathalie Miebach spoke at the Queens Museum of Art as part of the SPWS guest lecture series, and in conjunction with Queens International 4 Public Programs. 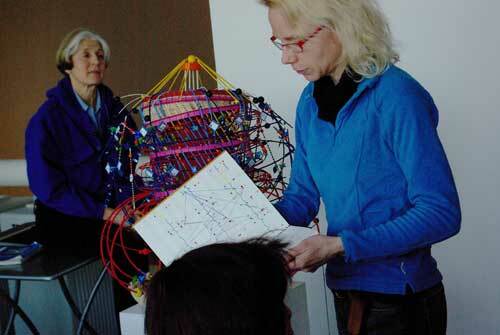 Nathalie described how she takes weather data and translates it by hand into amazing woven sculptures. Data for specific periods of time and place are represented by color, material or type of placement—parameters defined ahead of time—and then the sculpture emerges in the weave from the dictates of the data, the end result not known at the outset. Taking direct atmospheric observations into account through recent art residencies in very different weather environments—the tides of Cape Cod and the tornados of Nebraska—she explores the role visual aesthetics and personal experience play in understanding scientific information. The weather data in her sculptural forms can also be interpreted as music, where a new sort of musical score can be read directly, in a spiral, from the weave. She is currently collaborating with musicians to interpret these sculptures-as-music, and played 2 examples of remarkably different interpretations of the same sculpture, one by horn, one by piano. For more information on Nathalie’s work, and where to see it in person at her upcoming shows, visit www.nathaliemiebach.com. Thanks much to Nathalie for sharing your work with us! 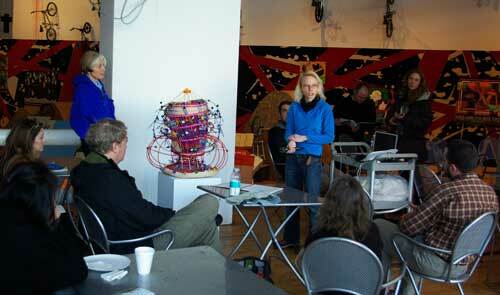 This entry was posted in Artists & Weather, SP Guest Lecturer Series. Bookmark the permalink.